Like many of you, I was intrigued... no, I'll be honest, I was bothered by the fact that the new Breyers BLASTS! lineup has two cookie based flavor. It just didn't make sense. So, like any well meaning reviewer, I went out and picked up a container of Chips Ahoy! BLASTS! Let's see how this compares to the Mrs. Fields Chocolate Chunk Cookie Dough BLASTS! Here it is and here's the description: Chips Ahoy! 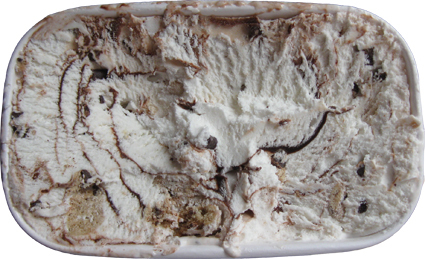 mini chocolate chip cookies, chocolatey chunks and a fudge swirl in cookie flavored frozen dairy dessert (with other natural flavors). Ok, now read that again and notice it says cookies, not cookie dough, and that my friends is the difference here. Hmmm, yeah, ok, not exactly what I was expecting. There are six cookies in this shot, can you spot them all? Before we start, let's take a closer look at the cookies. Now I'm glad this picture came out because you can see just how big these cookie chunks are (they're about a quarter inch thick). These may actually be the biggest cookies I've seen yet. They are bigger then the ones I found in Turkey Hill's Ginger Snap Ice Cream, and maybe even bigger than the ones in Ben & Jerry's Snickerdoodle Cookie Ice Cream. Now that I've got your hopes sufficiently raised.... let me take them back down a few notches. This flavor is a weird one, at least that's what I thought at first. On the first scoop, I couldn't get the thought of coconut out of my head. The weird combo of taste and texture threw me for a loop and I really didn't know what to think. I was totally put off and had no urge to go try it again. Overall, I'm going to give Breyers some credit for their creativity, and I'm guessing this flavor will work for some people, it's just not made for me. Just do your best to keep an open mind with this one. Good to know. I still must try this one as well. I am a freak for anything cookie dough/cookies and cream. I might actually like the coconutty taste too. Well since I love coconut, this might be more to my liking. Is there coconut oil in the ingredient list? Shame you didnt like this too much :( it looks quite tasty but if it didnt deliver on flavour! By the way..."on second scoop" the S'mores is definitely my favorite. Maybe yesterday was a bad day for my sweet tooth or something because it sure doesn't seem to bother me today!! Looks so yummy and delicious! I really love ice cream,I must try this! The extra ingredients are tasty enough, but the 'frozen dairy dessert' substitute for ice cream is not very good, and certainly not anything like ice cream. Anyone familiar with the historically great Breyers ice cream will be sorely disappointed in the base of this stuff! I picked this up last night and actually liked it...the past few years I've hated Breyers so I'm glad they won me back with this one..I also thought of an ice cream sandwich and I totally appreciate the crunchy cookies..I love coconut but I def didn't pick up on it like you did Dubba.. I did not enjoy this product at all. Almost all of the Chips Ahoy! cookies in my container were grounded up and swirled throughout like a ribbon. In the whole container I had about 4 bite-sized cookies. Now, the ground up cookie bits wasn't a bad thing - it's not what I was expecting - but it works if and only if there is enough of them to go around. While there was a fair amount I still wanted more. But for me the true spoiler was the fudge and chocolate chips as there was way too much of them. The fudge was so abundant that it turned my white vanilla ice cream into a brownish color that tasted like a mellow chocolate ice cream flavor. Coupled with the abundance of chocolate chips, the chocolate flavor was too overwhelming, ruining the entire treat. 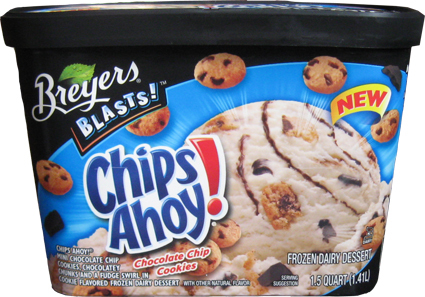 What Breyer's should have done was remove both the fudge swirl and the chocolate chips and double or triple the amount of cookie bits - both the ground up cookie bits and the whole, bite sized cookies - to compensate for the removal of the fudge and the chocolate chips. Then, this would be a better frozen dairy dessert with the mighty cookie flavor that I was looking for. Your explanation of what they were going for with this ice cream has me at least appreciating it a bit more. I can see how it'll be really tasty to some people. I thought the idea of yummy cookie chunks in normal, vanilla-flavored ice cream sounded great! It wasn't until I got home and tried it that I realized the ice cream was "cookie-flavored." To me it tasted like over-sugary frosted cupcakes, lol.